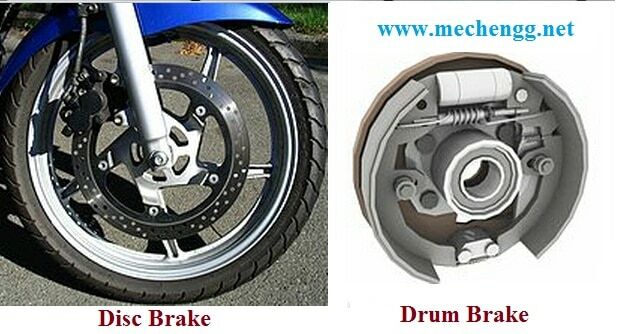 A brake is a mechanical device which inhibits motion, slowing or stopping a moving object or preventing its motion. To stop the vehicle safely in shortest possible distance in case of emergency. To Control the vehicle when it is descending along the hills. To keep the vehicle in desire position after bringing it in complete rest when there is no driver. Most brakes commonly use friction between two surfaces pressed together to convert the kinetic energy of the moving object into heat, though other methods of energy conversion may be employed. For example regenerative braking converts much of the energy to electrical energy, which may be stored for later use. Other methods convert kinetic energy into potential energy in such stored forms as pressurized air or pressurized oil. Eddy current brakes use magnetic fields to convert kinetic energy into electric current in the brake disc, fin, or rail, which is converted into heat. Still other braking methods even transform kinetic energy into different forms, for example by transferring the energy to a rotating flywheel. The brakes for automotive use may be classified according the following considerations. Based on the above considerations, brakes are classified with respect to following factors. 4. With respect to the method of applying the braking force.